At this time of year we all have a tendency to over stock on food. So using up your leftovers is always on the menu right now. And at the same time having some nice healthy soup for lunch after all the over eating and rich food seems, to me at least, to be the order of the day right now. I love ham, really adore it. And a Christmas ham supper is probably (no definitely) my favourite meal of the season. I made a ludicrously massive Christmas ham seeing as I was only cooking for my brother and his girlfriend so I have loads to use up. I also made some delicious ham stock from boiling it. 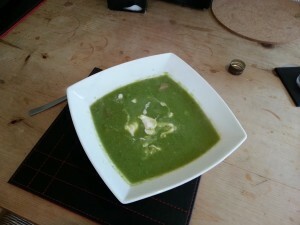 So ham and pea soup seemed the logical choice to use up some of my leftovers. Obviously if the ham is very Christmassy like mine you probably want to avoid getting too much of the really glazed stuff into the soup, try and use ham more from the middle. First up roughly chop the onions and leek and lightly sweat in some olive oil. Once cooked set aside a small amount to add later after soup has been liquidized. Add the ham stock, some salt and pepper, about a 1/3 of the ham (mostly smaller pieces) and all but a handful of the peas . Bring to the boil and leave to simmer for about 10 minutes. At this point get a hand blender and whoosh up all the mixture into a smooth and creamy consistency. If it is a little too thick for your tastes then add some more boiling water. Then add the rough vegetables, remaining peas and the remaining ham. Serve in piping hot bowls with a dollop of Crème Fraiche. Easy peasy (groan) huh? And it is delightful. Obviously any pea soup the quality is determined mostly by how good the peas are. I made it once with crappy tinned peas and it was horrid. Ideally you would pick them out of your garden and make it straight away. But for most of us I think it is down to getting slightly better quality frozen ones. Hope yous enjoy! I did.